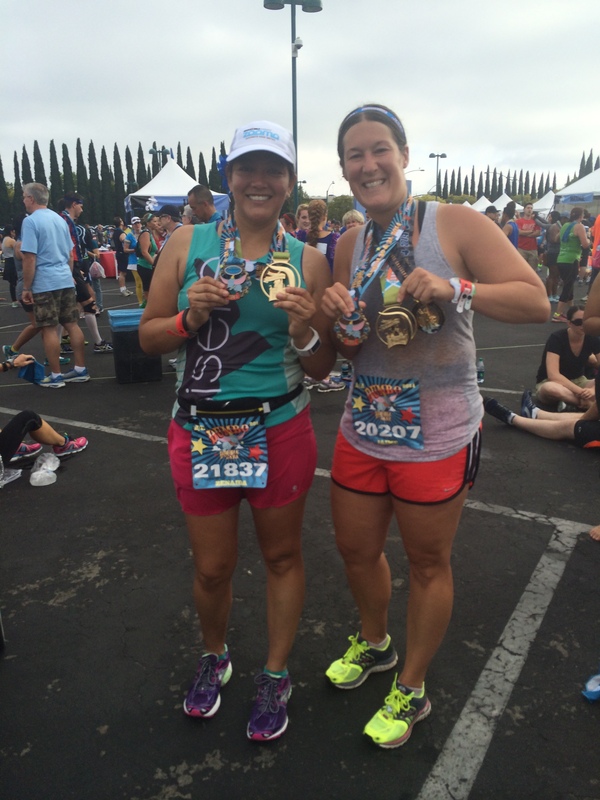 Sunday was the half marathon and last race of the Dumbo Double Dare. 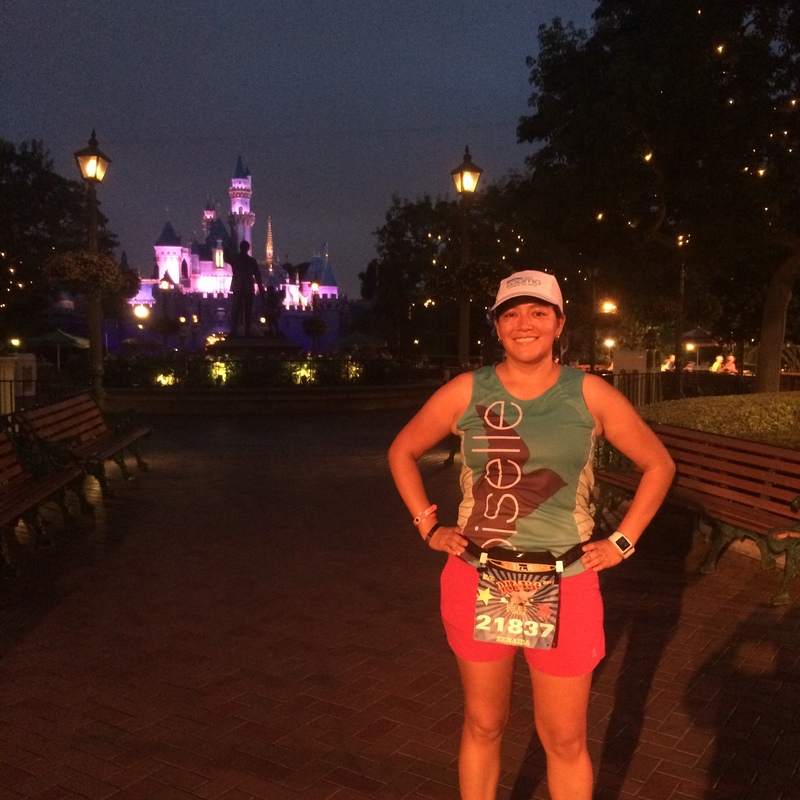 It will be my last Disneyland race because I have decided not to run any more races there. Definitely too expensive. Another 4am wake up call. I did not want to drink another cup of terrible coffee so I made a stop at Starbucks. The line was LONG. I then had to use the bathroom and was glad to use one in Downtown Disney instead of a port-a-potty. 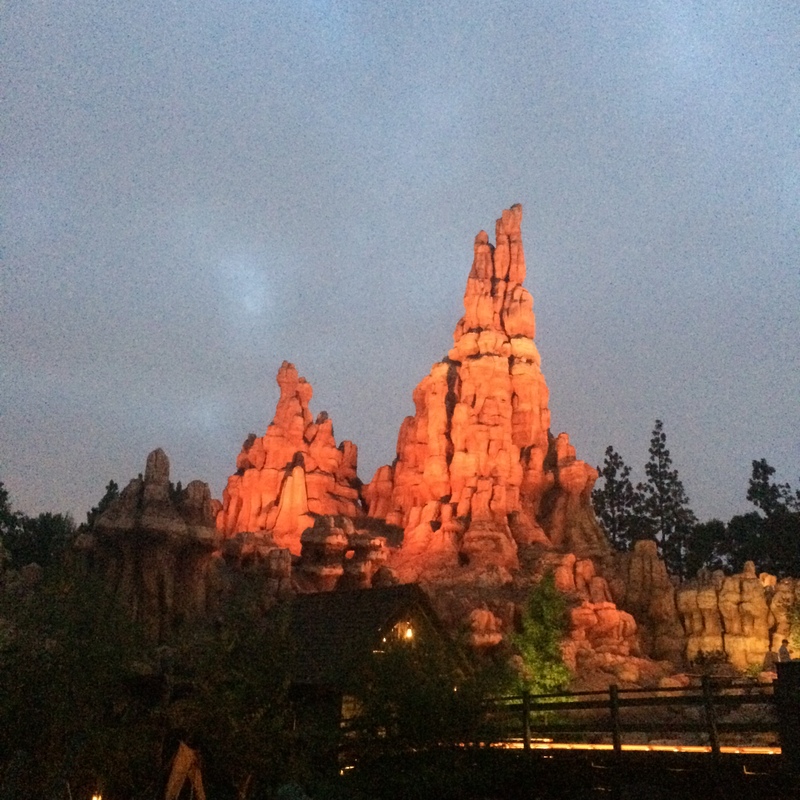 Jaime and I were in our corral by 5:10. I was feeling really good in the beginning but then struggled for the next 12 miles. It was very humid and I was sweating a lot before mile 1. It could have been that I had just finished my coffee. A mistake I don’t plan to repeat. My plan was to run with Jaime but yeah that did not happen. I took it easy and ran slow the rest of the race. I took pictures and drank water at every water station. 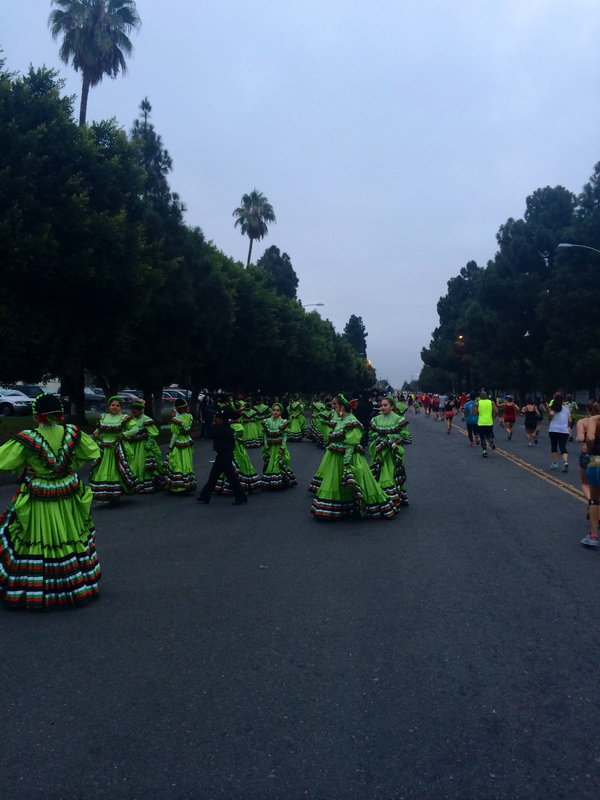 The folkloric dancers were finishing their dance but I could hear the mariachi music as I was running. 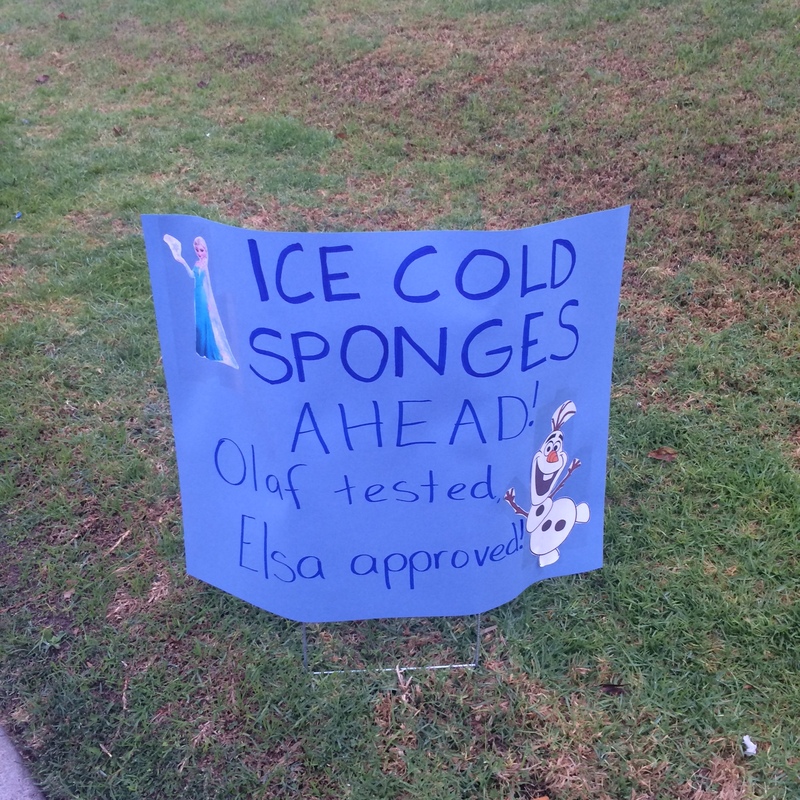 It was hot and these sponges came in handy. I remember someone was handing out oranges which were really good but can’t remember if it was at this stop. Had a blast watching these dancers and the little girl was adorable. 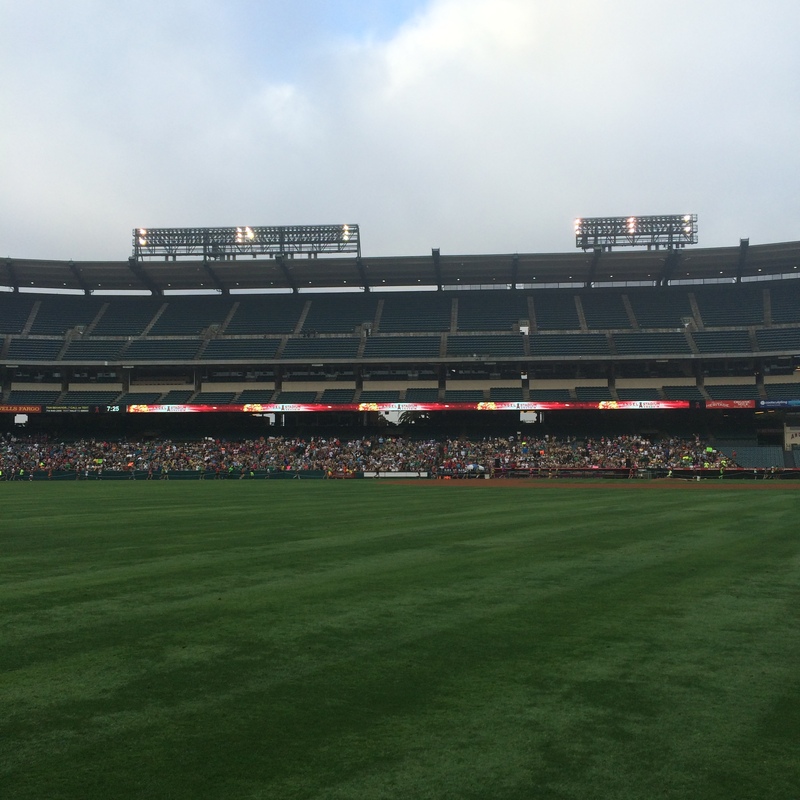 Pretty neat running through Angel Stadium. This was maybe mile 9 or 10. I did not know how much longer it was going to take me to run the rest of the race so I sent a text to Jaime telling her not to wait for me at the end and to instead head over to the hotel. She is a good person and told me that she would wait for me. Jaime and I with our medals. She got an extra one because of the Coast to Coast Challenge (running a race in both FL and CA in the same calendar year). My three medals from this weekend. My favorite is the one for completing the Dumbo Double Dare. 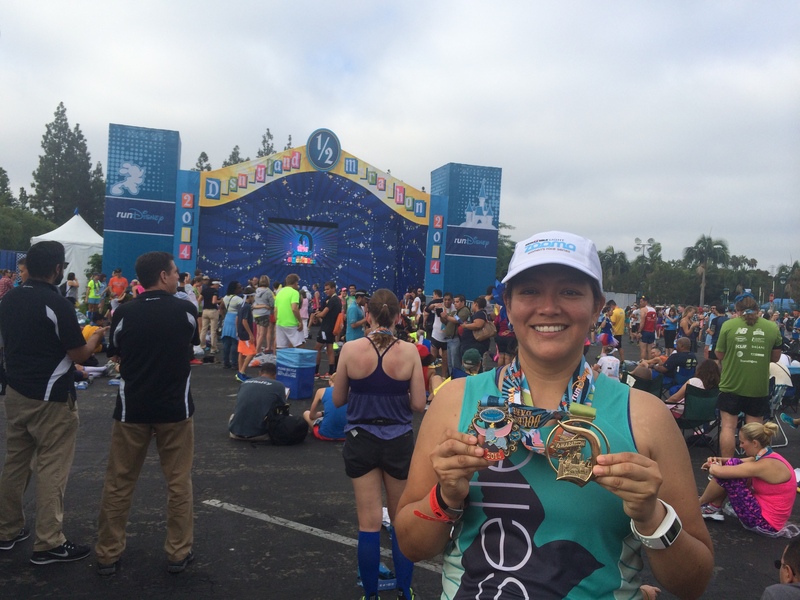 Overall it was a great race and I had fun running through the parks. Many people had wonderful costumes and for one second I was jealous of not wearing one too. I can’t remember which characters were at the parks. I saw Jeff Galloway at the expo but not during my races. I ran really slow. I wore shoes with more cushion (Brooks Ravenna 5) but my toes still hurt. I am worried because I don’t know how they will feel for the rest of my long runs for marathon training. Nice pics and medals. Congrats on the Dumbo Dare! Thanks. And yes I agree on the medals. 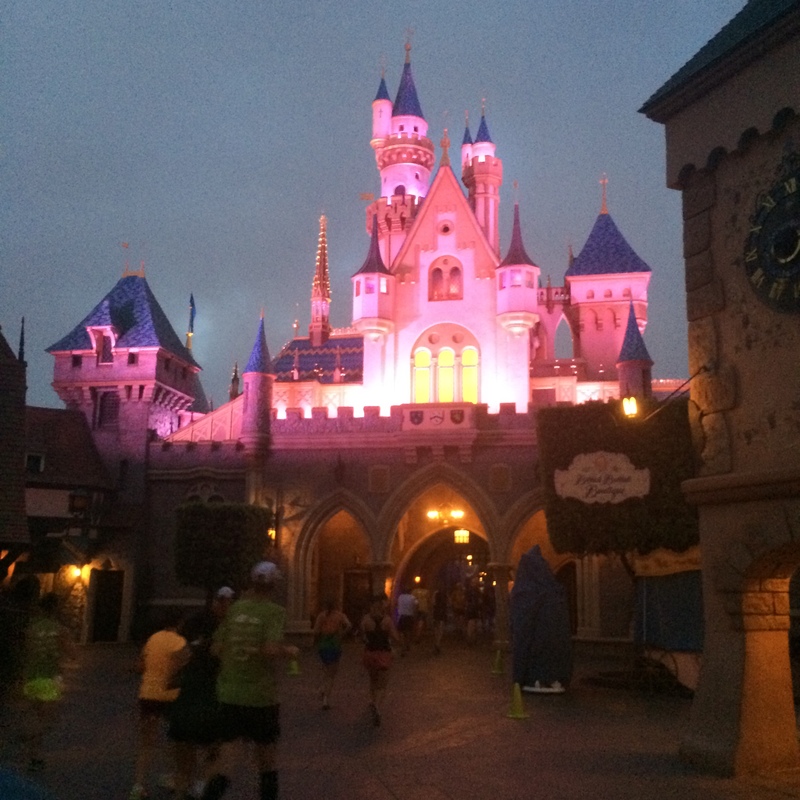 I’ve never done a Disney race. Looks like fun though! You should do Tinker Bell in CA. It is closer to Oregon so at least you won’t pay too much for airfare. Ahh, good point on not drinking something hot before a race! I have read a tip before to drink something cool but that wouldn’t wake you up! I should have known better about the coffee. But I just know that I feel horrible if I don’t drink any in the morning. 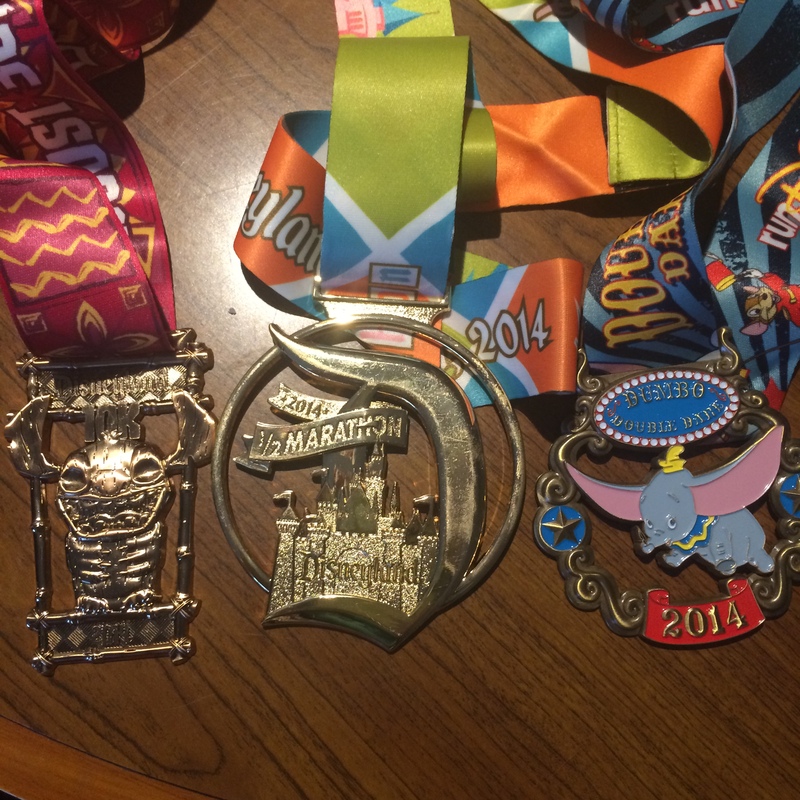 Great pictures and recap, and congratulations on completing the Dumbo challenge! Bummer that we didn’t get to see each other at all over the weekend but I am glad that you had a great time in Anaheim. 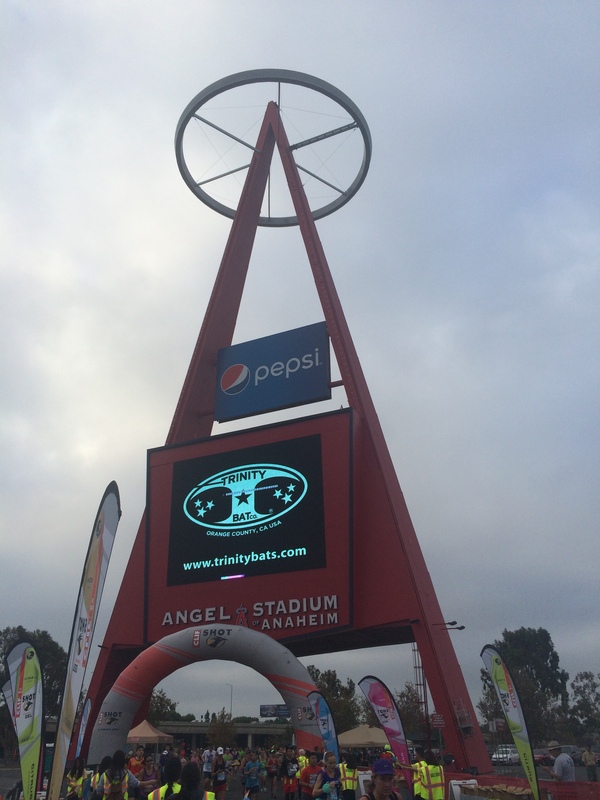 I agree with you that Angel Stadium was a huge highlight of the course, other than the parts in the parks during the first four miles. 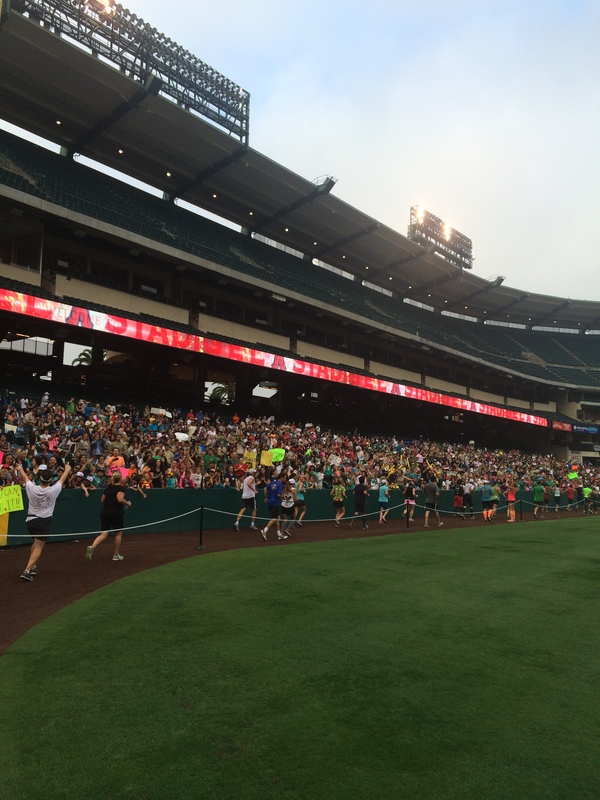 Were you able to get yourself into a higher corral that morning at the start? Thanks Emily. Yes, I was able to get into Corral A. 😉. I don’t love the medal but it is OK. Need to hang it up with the test of my Disney medals. Definitely let’s coordinate for Wine and Dine. 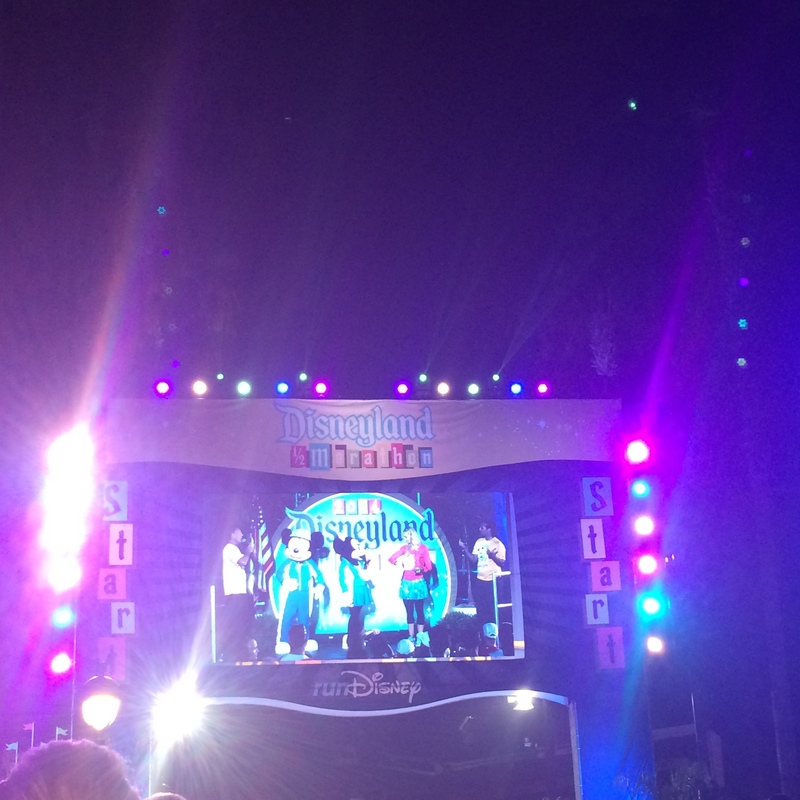 That looks so fun and congrats on completing the Dumbo Double Dare. 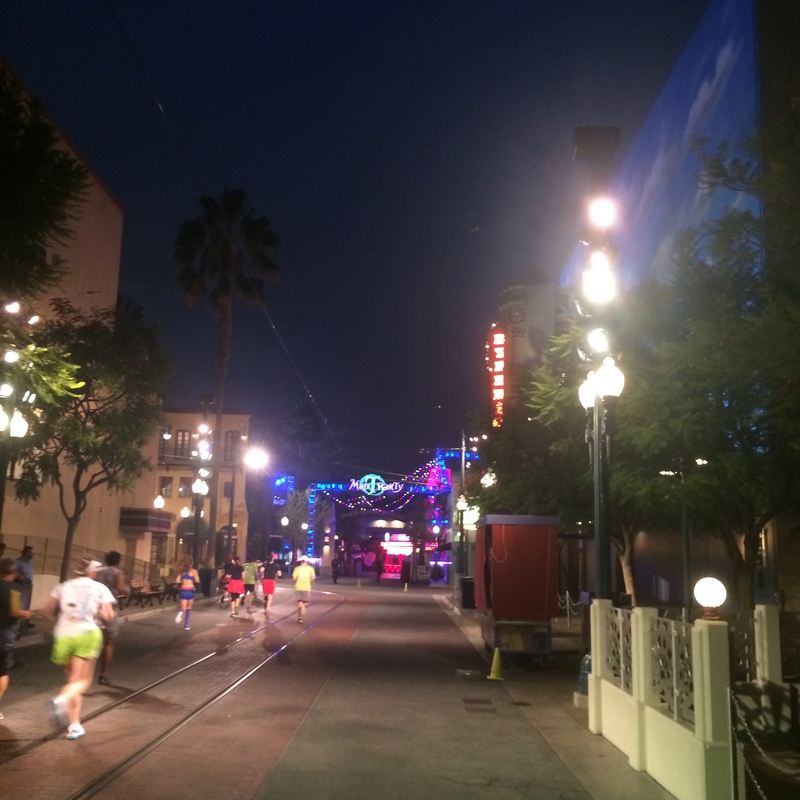 This post makes me very excited for my first Disney Race experience in January! It will be an experience to remember!